Cookbook author and teacher Diana Kuan writes about traditional and modern takes on Asian home cooking on her blog, Appetite for China. 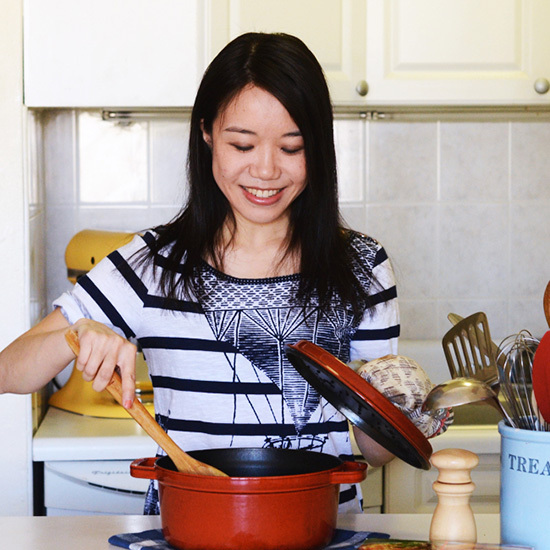 The Blog: Cookbook author and teacher Diana Kuan writes about traditional and modern takes on Asian home cooking on her blog, Appetite for China. She has also recently launched an online shop called Plate and Pencil, with cute gifts like a “Dumplings Around the World” tote bag. I never knew you grew up in Puerto Rico with a family who ran a restaurant. So cool! What are some examples of "Latin-flavored Chinese" dishes? There's a long history of Chinese migration from southern China to parts of Latin America. My extended family ended up going to Puerto Rico via Cuba, with other extended family members ending up in Mexico and Guatemala. So when my parents and I first immigrated to the US, we spent some time in Puerto Rico where my uncle and aunt had a restaurant and where I ended up going to kindergarten. I remember eating some very interesting dishes while living there and visiting years later, such as wok-fried chicken with tostones (fried plantain slices), sweet and sour pork with fresh pineapples, and pollo al ajillo (garlic chicken stir-fry). My family's restaurant also doubled as an ice cream parlor, so on the ice cream side they also served homemade tamarind and coconut ice cream for dessert. I also find it fascinating that Cuban and Peruvian cultures also have their own versions of Chinese food that are well-integrated into the local cultures, with their own ways of making fried rice, chow mein and lo mein, and roasted and stir-fried pork dishes. What are some favorite Chinese restaurant dish discoveries from all of your travels? I have so many favorite Chinese dishes from my travels, but one stands out for being both delicious and unusual. One night at a restaurant in Beijing I ordered Yunnan goat cheese off a menu out of sheer curiosity. Before, I never knew China produced any type of traditional cheese. But Yunnan cuisine does have a delicious fresh goat cheese, called rubing in Mandarin, that looks a tastes a little like halloumi. I've had it pan-fried with a little salt, pepper, and sugar on top, and simmered with fava beans; it's delicious both ways. You teach a lot of dumpling classes. What are some secrets? What are common mistakes people make? I see a lot of people making fillings that are too bland. With the right amount of sesame oil, rice wine, and soy sauce or salt, you get a flavorful dumpling filling that makes the dumplings taste good on their own, without needing to douse them with soy sauce before eating. There isn't really much of a secret to folding dumplings and wontons other than watching carefully while someone shows the various folding methods and practicing over and over. Usually by the 4th of 5th try students get the hang of it. What are some Asian ingredients you wish would become more accessible to people? I think Chinese black vinegar is highly underrated! It's a delicious aged rice vinegar that's very similar to balsamic vinegar but a bit maltier and a tiny bit sweeter. I love using it in some of my favorite dishes, including Kung Pao Chicken, Sichuan Wontons, and Sichuan Eggplant. Fermented black beans is another one. It is so earthy and complex and perfect in dishes like Mapo Tofu and Twice-Cooked Pork. And I really wish Sichuan peppercorn were more widely available. It's the backbone of Sichuan cooking and just so insanely addictive. What are your favorite hacks for using supermarket ingredients in Asian dishes? Fortunately these days it's easy to find the majority of Asian ingredients I need in Western supermarkets. However, there are some ingredients like Chinese rice wine that I can't find, so I substitute dry sherry. Apple cider vinegar also makes a great substitute for Chinese or Japanese rice vinegar. I've also used broccoli rabe in place of Chinese broccoli, porcini mushrooms in place of dried shiitake mushrooms, and spaghetti in place of Chinese egg noodles. I come from the school of thought that you should always experiment outside the boundaries of a specific cuisine. Sometimes you come out with surprisingly great results. What food bloggers are you newly excited about right now? I just started reading My Name is Yeh and love her creative takes on Chinese and Jewish food, with some Midwestern flair thrown in. I also adore The ABCD's of Cooking, an Indian cooking blog written by Chitra Agrawal, my co-chef for an Indian-Chinese pop-up dinner series that we do every season in Brooklyn. Green Kitchen Stories is a gorgeous read and makes me want to go travel around Sweden again. I'm also crushing on Paper and Salt and Eat This Poem, two food and literature blogs that make great bedtime reading.